The Food Safety Program is concerned with the sanitary operation of the restaurants, retail food establishments (grocery stores), mobile food operations, vending machine locations, as well as temporary food booths at festival events in Warren County. Our Environmental Health Staff review plans and equipment lists on new operations to ensure a clean, sanitary start in the food operation business. Each food operation in Warren County is inspected two to four times a year to ensure the sanitation of the operation does not deteriorate allowing food to be sold that could result in illness. The inspection frequency depends on the risk posed and past quality of the operation. Mobile and Temporary Food Operations are also inspected during festivals and special events. 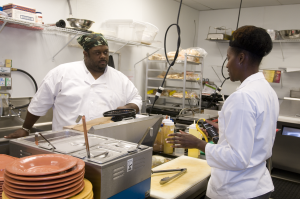 Information on obtaining each of the Food Service Licenses can be found in the Documents section to the right or below.